SaveToDB allows connecting to database tables & views. You may select SELECT & WHERE fields and change filter values using the ribbon or named cells. Use Data Connection Wizard for the first connection. Then you may select the query object using Query List. You may have fewer worksheets and refresh query lists to get new tables and views from a database. SaveToDB allows connecting to stored procedures. SaveToDB places stored procedure parameters on the ribbon, and you may change parameter values. Developers may specify value lists for parameters. The value lists may contain ID and value pairs. You may use Query List to change the active procedure. The SaveToDB add-in allows connecting to web pages and web services. 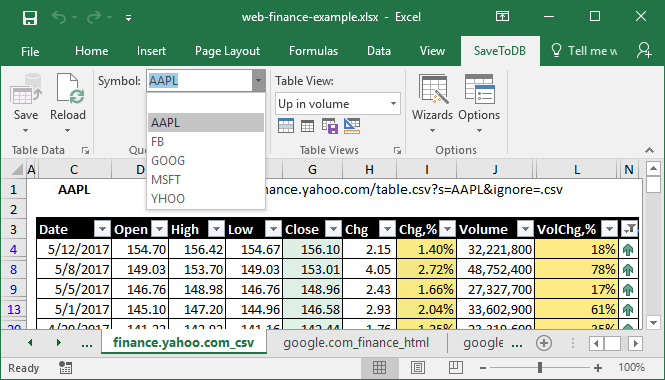 SaveToDB converts HTML, XML, JSON, XML, plain text and CSV data into Excel tables. So you may load financial reports, stock and option quotes, fundamental data, social contacts, etc. in Excel. Then change query parameters using the ribbon. SaveToDB preserves formulas and formatting. 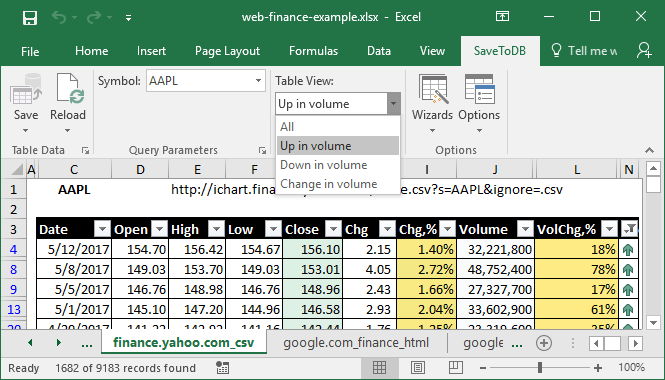 You may save multiple views of underlying tables. Apply auto filters, sort data, hide columns, add subtotals, and save the view with a clear name. Then activate the view when you need from the view list. This feature works for all Excel tables. Developers may install SaveToDB Framework in a db. 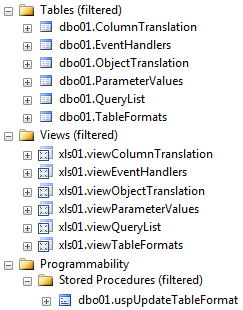 And you may save Excel formats for database objects in a database, including saved table views. Your colleagues will load the formatted data. Use Table Format Wizard to manage formats. SaveToDB allows saving data changes to database tables. Yes, you may use Excel as a database table editor. Use Search & Replace or formulas, and save the data. Developers may configure saving changes for data loaded from views and stored procedures. Developers may specify SQL codes or stored procedures for INSERT, UPDATE and DELETE operations. Another way to save changes is using SQL codes or stored procedures as cell Change event handlers. So the database is updated immediately after the change. To add handlers, install SaveToDB Framework and add configuration records to the EventHandlers table. Handlers may use values from table columns. 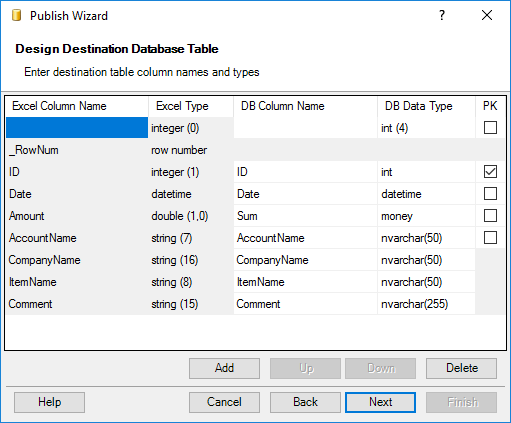 SaveToDB allows designing database tables and inserting data from Excel using the Data Publish Wizard. After publishing your team may edit database table data from multiple workbooks connected to the table. This is the easiest way to share data with your colleagues without sharing workbooks. The ColumnTranslation table may be used to translate column and parameter names to a business language. 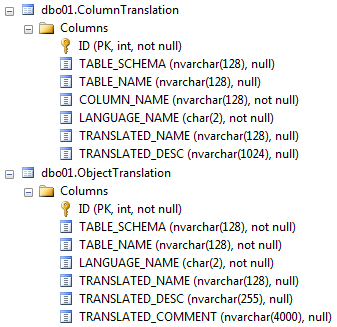 The ObjectTranslation table is used to translate database object and event handler names. SaveToDB performs translating in Excel. Developers may define stored procedures for the SaveToDB Actions menu for every database object. 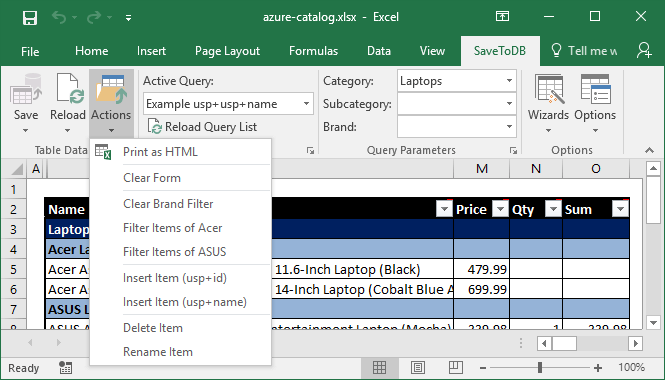 SaveToDB shows items related to the active Excel table. The add-in requests parameter values before calls. Use the object translation feature to show user-friendly names in the menu. 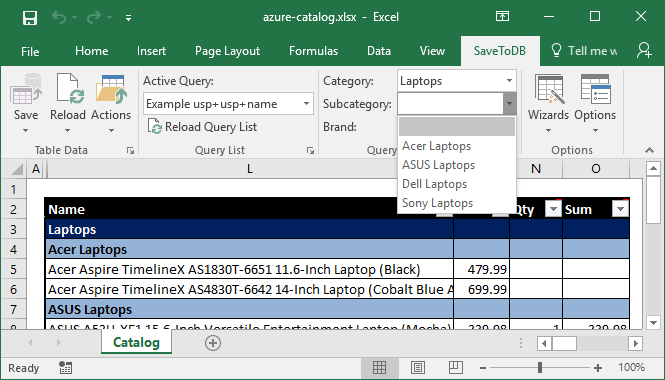 Developers may add queries to the Excel context menu. The queries may use values from the active row. SaveToDB allows using tables, views, stored procedures, HTTP requests, macros, batch files, and CMD commands. Outputs: a worksheet, popup window, or a browser. 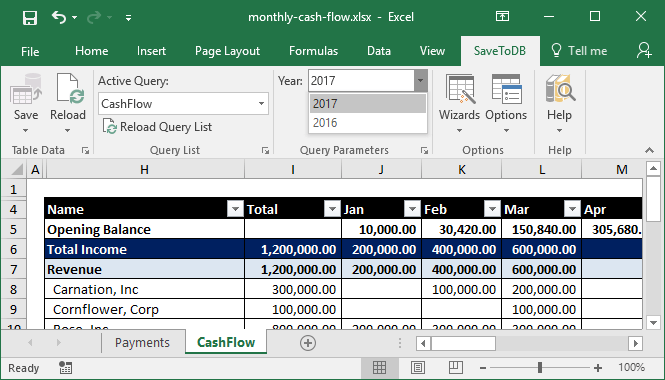 SaveToDB allows defining Excel formulas in database views and stored procedures. For example, line totals can be calculated in Excel. You may use different formulas for every row like DDE. Formula results can be saved back to a database. The SaveToDB add-in has a lot of features. And you may use it from VBA as a database or web layer. Just connect a workbook to the web or a database, implement server-side logic and call add-in methods. 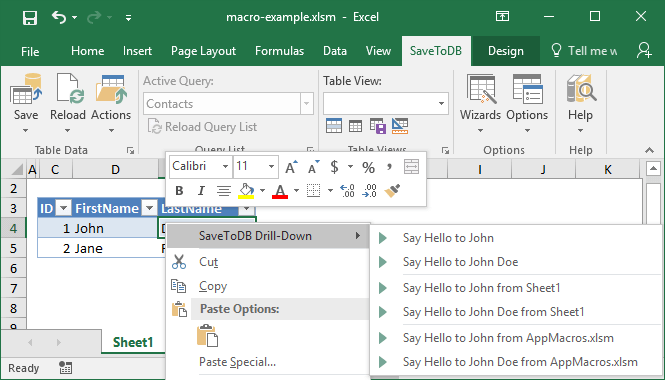 SaveToDB allows executing VBA macros from the Actions menu and from the Excel context menu. Macros are shown for related objects only and can use context values. VBA macros can be placed in separate workbooks. So you may update the macro workbooks only. SaveToDB Framework contains tables, views, and stored procedures to support advanced SaveToDB features. You may install it in your database using the Framework Installer wizard and edit configuration tables using Excel. Use Configuration Workbook Generator for this. Microsoft Excel is the best app for working with tables. Users know and like it. 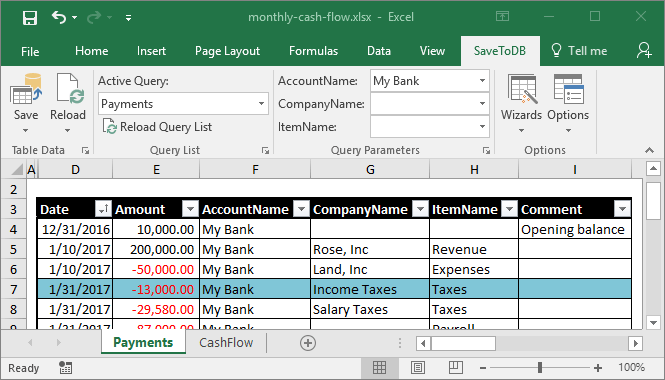 The SaveToDB add-in allows implementing most client applications with Excel using Excel & SQL only. using database development skills only. Download and unzip the SaveToDB package to a local drive folder. Run setup.exe and complete installation steps. Open Microsoft Excel. You should see the Database tab.